Disclosure: This visit to El Capitan Theatre was hosted, but all thoughts and opinions are my own. I have been going to the El Capitan Theatre in Hollywood, CA since I was a kid! The historic theater on Hollywood Boulevard is a Disney fan’s dream! Owned by Disney, only playing Disney movies, and having epic opening nights where Disney fans come together and celebrate a new film’s release feels like pure magic; bringing together the Disney community in an intimate yet epic way. To start off the Ralph Breaks the Internet opening night, I took our picture we always have to get when we visit: Amelia’s photo at night in front of the marquee saying the film that’s playing! Next, we stopped by the Disney Studio Store adjacent to El Capitan to get a sample of Ghiradelli chocolate and see the new Ralph Breaks the Internet merch. Once we entered the lobby, we got special Ralph and Vanellope popcorn buckets that everyone got opening night (they will also be available for purchase at the concession stand while supplies last). They also had some adorable movie popcorn buckets and cups with character straws! Then we were waiting for a very special moment: Getting to meet Ralph and Vanellope themselves! My daughter absolutely LOVES both these characters, so I knew she would be super excited. She sat and played Sugar Rush while we waited. Then when she saw Ralph walk by, she rushed over to give him a hug! Right before Ralph left, Vanellope came over to give meet-and-greets. At that moment Amelia, myself, and so many of our Disney friends who were also at El Capitan Theatre got an epic group photo! 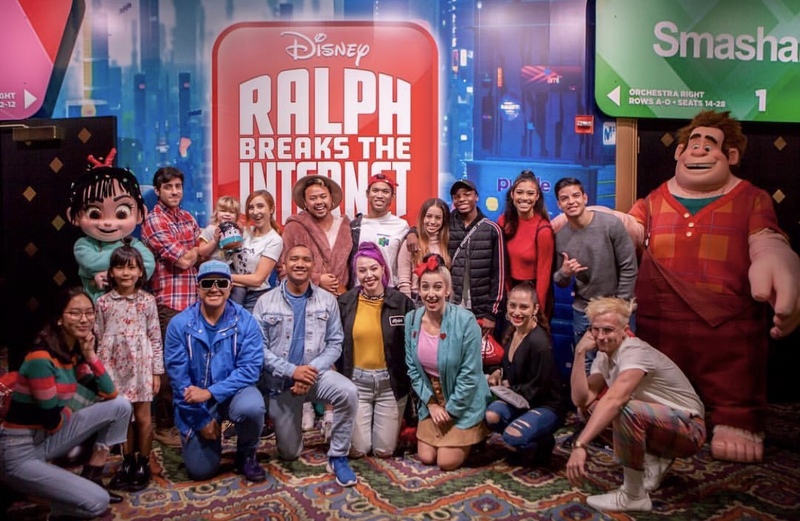 My friend Francis pointed out on Instagram that it’s pretty amazing that the group of people pictured above all met on the internet, and now we were coming together to celebrate a special event in the Disney community, a Disney opening night, for Ralph Breaks the Internet! Pretty meta, huh? Ralph Breaks the Internet plays at El Capitan Theatre until December 16th. Get your tickets now to experience the character meet-and-greets, and the amazing light show that plays along to Imagine Dragons’ “Zero”.